With the one year anniversary of Black Junction coming next month, we want to do something epic for the platform and its members. 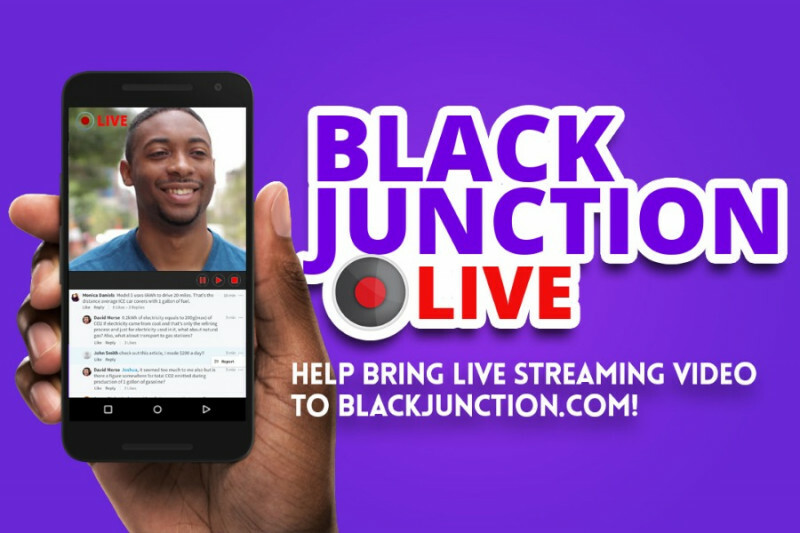 It's time to make Black Junction a viable alternative to the other major Social Media platforms, by bringing Live Streaming Video to the platform. After a year of building the platform, it's time to take it to the next level. In 2017, video is an integral part of the internet. As we plan on growing Black Junction and giving the Black Community a legitimate alternative to Facebook, live video streaming is a must-have feature. We can't expect Black people to come to our platform in large quantities, if we can't provide such an essential feature. Another reason Live Streaming Video is so important for us, is the ongoing state of affairs between Law Enforcement and the Black Community. We desperately need a platform that allows us to instantly record, share, and save our interactions to a safe place. Facebook is not the place for this! We should all be aware of the way they handled situations like these in the past; Korryn Gaines is an example. When Korryn tried to use FB Live to record her confrontation with law enforcement, Facebook shut off her feed moments before she was killed. We need a platform where we can document these interactions in real-time and not worry about them being removed or shut-off. For the last year, Black Junction has been funded almost completely by its two founders. We have put a lot of money, time, and effort into consistently growing this platform. We plan to continuing doing that, however this project is too big for us to cover on our own. So, we are reaching out for help from our community. We have proven that we are capable of building and running a real social media network. The proof is BlackJunction.com. Now we need your help to take this much needed platform to the next level. Black Junction Live will let you connect with the community easily, quickly, and productively. Your friends and Page followers will receive notifications when you start streaming, so they know to tune-in to your broadcasts at just the right moment. Streaming video is the best way to interact with viewers in real time. Build a rapport, answer questions, have live discussions, hear what's on people's minds, and get their Live Reactions to your video content. In 2017, video is king! This is why we need to built a dedicated place to record and store live streamed video content on Black Junction. With this functionality, you will be able to instantly and easily connect with your friends. What is Black Junction Live? Black Junction Stream will allow people to instantly share live streaming video with their friends on Black Junction. Will Black Junction Live be available to everyone on Black Junction? Yes! Like all features on Black Junction, instant streaming will be available to all profiles on the site. What happens to the video after the live stream ends? The video will be published and stored to the user's Page or profile, so friends who missed it, can watch it at a later time. The streamer can remove the video post at any time, just like any other post. Where will streamed videos show up on Black Junction? Videos will appear in the streamer's profile or page timeline. Anyone who is friends with the streamer or liked the streamer's Page will be able to see the video. Will there be a time limit for Streamed videos? Streamed videos will have a limit of 30 seconds when it first launches, however we will increase this limit as the infastructure of the platform grows.